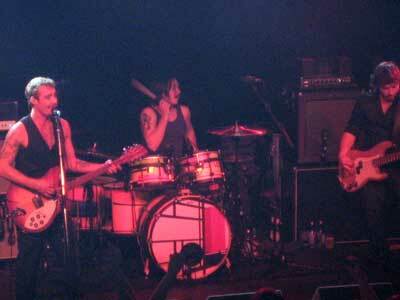 This was my 8th silverchair show, and I'm thinking it might have been my favourite one yet. All the other shows I've seen have been in London over the years, except for one in 1999, when out of desperation I flew out to New York to see them support Blink 182! This show at Rock City was different. It probably had something to do with the venue and the crowd. I had never been to Rock City before, so didn't really know what to expect. But the difference to any other venue I've been to was the AMAZING sound! And the EXTREMELY vocal crowd! Even before silverchair came on, you could hear the crowd singing and chanting en mass. It was quite a long wait between the support band and silverchair, or at least it felt like it! Eventually my friend was moaning that she had completely lost interest, and the crowd were singing 'After All These Years' haha. The guys seemed in high spirits. I had thought at Brixton that they were pretty pleased to hear the crowd singing along to the new stuff, but here at Rock City they looked almost astounded. The addition of Paul Mac on this tour I believe to be a godsend, not only for his talent on the keys but his bond with Daniel is obvious and perhaps this has helped bring the silverchair guys closer together aswell. Whatever it is they just all seem to be really at ease with each other, which is so assuring for us to fans to see. As with at Brixton Daniel demanded our participation every step of the way, though he didn't need to so much with this crowd as he had them right in the palm of his hand from before it had even begun! We screamed meaningfully for Ben, we screamed 6 times for Chris, haha. Chris had a huge portion of the crowd chanting his name, and at one point I do believe I even saw him clapping along with the crowd! Go Chris! Daniel was like a mad man shaking his head Beethoven style, messing his hair up and playing guitar with his teeth. Ben was grinning as if he was the cheshire cat off in Wonderland again. When the crowd started chanting for Israel's Son relentlessly towards the end, I had mixed feelings. Thinking of the band it must be abit frustrating when you're trying to move on and grow with your musical abilities, on the other hand it would have been cool to hear it, there was quite a long pause in the show where it almost seemed like Ben and Chris would have been delighted to oblige!! And everyone seemed to be on the edge of their seats! Daniel was having none of it though, hehe. As always they left us begging for more. A Silverchair show is more than just going to see your favourite band play live. It's always an experience, always a pleasure and always a privilage.